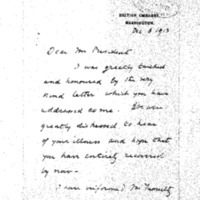 Cecil A. Spring-Rice writes to Woodrow Wilson regarding a meeting in his office. I was greatly touched and honoured by the very kind letter which you have addressed to me. We were greatly distressed to hear of your illness and hope that you have entirely recovered by now. I have informed Mr. Tumulty that any time which may be convenient to you will suit me. I will take the liberty to foward tomorrow copies of the address and other papers connected with it which have been sent to me by the municipality of Carlisle. I trust I may be allowed to take this opportunity of presenting to you Mr. Barclay Counsellor of this Embassy. Spring Rice, Cecil, Sir, 1859-1918, “Sir Cecil A. Spring Rice to Woodrow Wilson,” 1913 December 8, WWP18215, First Year Wilson Papers, Woodrow Wilson Presidential Library & Museum, Staunton, Virginia.